The full story of the club's history, from its humble beginnings in 1907, is chronicled in this 72 page book written by club member and ex-Captain, Jeremy Dixon. Starting with nothing more than a fascination with the game of golf, and the dream of establishing a course, the founder members led by a local merchant, Frank D. Dewse, faced incredible difficulties in establishing a viable club. To some extent this book is a social history of the area, illustrating the huge impact of both World Wars, and recognising the key characters whose determination allowed the club to overcome the sometimes overwhelming obstacles it faced in the early days. Alex Hay, a regular visitor to the club during his National Service days, pays tribute in his foreword to the wonderful welcome he received at Alderley Edge, and the club is very appreciative of his contributon to the book. The book is a softback publication and features an introduction by the Centenary Captain, Glen Swindells and Centenary Lady Captain, Celia Berent. Extensively illustrated throughout, it details the history of the club, its members and characters. or £ 7.50 if collected from the club. 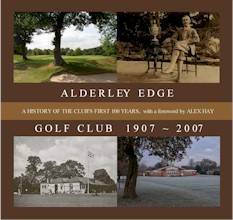 If ordering by post please make cheques payable to Alderley Edge Golf Club and mark your letter "Centenary Book"